​had its beginnings in the early 1980’s. Residents came together to support a proposed city ordinance designed to reverse decades of decline in what once was Sumter’s most fashionable residential area. In the years since, the Association’s name was changed to reflect expanding boundaries. Despite changes in name and borders, the mission to preserve, protect and promote the city and its largest in town historic residential area remains the same. Get to know neighbors in business and social settings. Showcase Sumter Cultural Center, Sumter County Museum, Memorial Park, and other neighborhood/Sumter resources. Combat deterioration of residential properties. Assist Realtors in marketing available properties. Partake and be instrumental in tourism events. 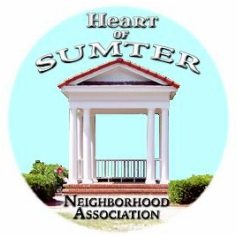 Support ongoing revitalization of Downtown Sumter. Click photo to view HSNA Facebook Page!